Recently I came across the book Cellblock Visions by Phyllis Kornfeld. "Cellblock Visions is a lively collection of inmate artwork, created behind bars, from county jail to death row – the alternative artworld flourishing today in American prisons. Men and women inmates, having no previous training, turn to art for a sense of self-respect, respect for and from others, a way to find peace. They transcend the cramped space, limited light, and narrow vistas. They triumph over security bans with ingenious resourcefulness - extracting color from shampoo, making paint out of M & Ms and sculpture out of toilet paper." "Dewayne Williams is incarcerated for life in a mental health unit at a medium-security prison. His sentence was originally life, but was later reduced to first-degree manslaughter. He can barely speak except in a low rumble of one-syllable words, responding only to direct questions or asking for something he wants. For many years he was seen walking across the yard with a strip of duct tape across his forehead, his home remedy for headaches. He was put on medication for epileptic seizures at thirteen (and has been on it all his life), but otherwise Williams had a normal childhood, functioning well in the family. There was no reported abuse and no show of violence on Williams's part until six months before the crime, when he began to rebel viciously against his mother's authority. he didn't fight with his father until one day when he was told to do yardwork. Williams' refusal was vehement, and later that day, he shot his father in the back of the neck. In prison, Williams was a recluse, too antisocial to double-cell, but he did participate minimally in some programs. For a few years, an art class was held on the unit, and he showed up regularly, without being called. He was mild-mannered and dove into his painting without hesitation, worked with complete absorption, and when he was finished, signaled by shoving the paper across the table and holding out his hand for another sheet. Self-portraiture is infrequent in prison art. When it does happen, the style is usually realistic, the pose, heroic. Tyrone O'Neil's [another inmate] portrayal of himself, seen later, goes much deeper to reveal layers of inner selves. 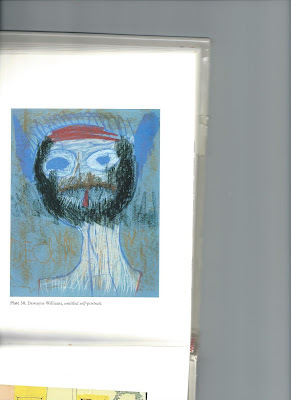 Here, Williams's portrait is a single aggressive blast of identification. If he could get red crayon or paint, Williams would use it to paint a broad stripe across his own forehead, taking off the duct tape first. He studied his reflection in a small mirror with great concentration to produce this untitled self-portrait [above]. He saw the red stripe across his head head, his pointed tongue, a vivid bush of facial hair (he was actually clean-shaven). He applied the medium with force. The face is blind with a fury that Williams himself does not speak of or act upon."